You want to sell me one? I seem to only find the 10 pack of the smart buttons but only have a need for one. Also do you know if they have an LED that will toggle with button presses? He accepted a Besf Offer of $54 so I’ll try em out. The same seller also has Iris v2 Contact Sensors in quantities of 10. I made an offer, which he countered and I then accepted. Pretty cheap way to get some decent Zigbee sensors. 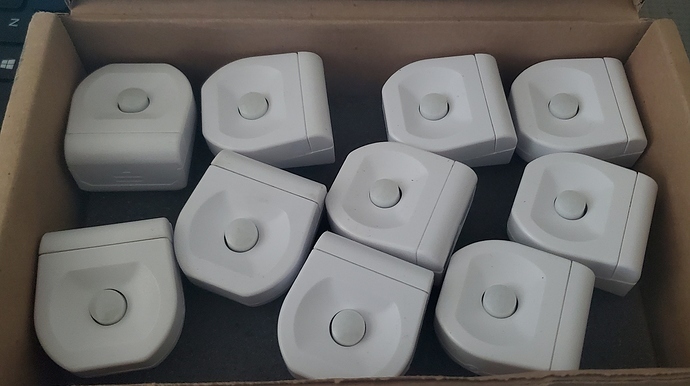 My 10 v2 Iris motion sensors should arrive today, so he also ships pretty quickly. I want my cut ! I got 10 motions paid with Iris gift card.... I need to stop reading this forum, I been buying stuff I don't need then giving them to friends for free.... not again. I received my motion sensors today. All have batteries installed, with the pull tab still in place. One of the ten had an oily residue inside it. Not sure it the battery was leaking, or something else. I took it apart and cleaned it, reinserted the battery and it paired up immediately. Battery reports 100% and motion/temperature both work fine. You actually paid money for those?!?! I have like 10 of these sitting in a box of junk HA sensors.. They are so crappy I feel guilty about pawning them off to anyone. I bet he is taking apart the old kits Lowes used to sell that included a motion, contact, button, and plug in varying quantities. Then selling them individually on eBay. I got one of those combo packs months ago on clearance for $15 so decent profit for this guy if my guess is correct! Well, I did not know you had a box of them. I want to use them to act as light switches for when I don't want motion detection to activate them. Sometimes, there is not enough motion consistently when we are reading or I am using the computer to trigger the motion sensor often enough to keep the lights on. What sort of other sensors do you have? I might be able to put some of them to good use. Besides SmartButton, I’ve got a couple PeQ leak sensors and some 2nd generation (300 series z-wave chipset) GE switches. I’ll have a look tomorrow and post a list. Nice! I made an offer on the exact same auction, an hour ago. I don't need them, but the price was awesome. I think I just scored a great deal. I got all Iris second gen stuff. 3 motion sensors, 3 contact sensors, 2smart switches (the ones that Z-Wave repeat), a smart fob, and a keypad for $53 shipped. I got my motions today, all came with the plastic to pull on the batteries. Got my order today, and same thing...each one has a battery with the pull tab. All but one of them looks virtually new, and even that one cleaned up well. I paired one and battery is 100%. I missed out on the original deal, but getting them when I did at $6/sensor is still great as far as I'm concerned. And now that I've seen these in person, I completely understand why everyone says the Bosch motion sensors are huge. Mine came in today but I am still at work. Its good to see that they come with the batteries and are possibly brand new. Also for anyone that has not already bought them, don't forget you can use the make an offer option, I ended getting 10 for $45. They are great little sensors and some of the smallest ones I have seen. So far battery life has been good too. Even ones in high traffic areas after 6 months have over 85% battery. I also have the door/windows sensors and they have been solid. I received my 10 Iris Contact Sensors today from the same ebay seller. All appear to new, and have batteries with pull tabs. They did not come with the magnets (nor did the seller show or promise magnets). I have magnets from some Z-wave contact sensors that I will use. Not a big deal. I do like the small form factor of these v2 Iris contact sensors. Overall, I am set for a while and will now be able to remove the remaining few Z-Wave devices from my house. I really like my current combination of Zigbee for outlets, sensors (motion and contact) and bulbs (Sengled), along with Lutron Caseta for switches and dimmers. Everything works very reliably and quickly. Thank you @tonsofguns Matt for the ebay tip!